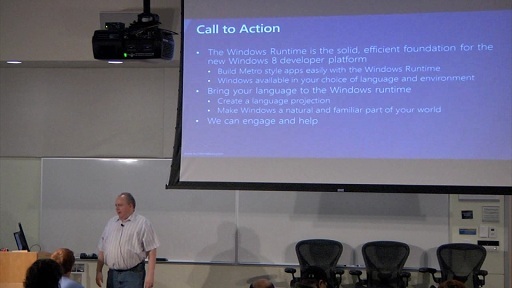 The Windows Runtime (WinRT) is a key piece of technology used by all Metro style apps in Windows. 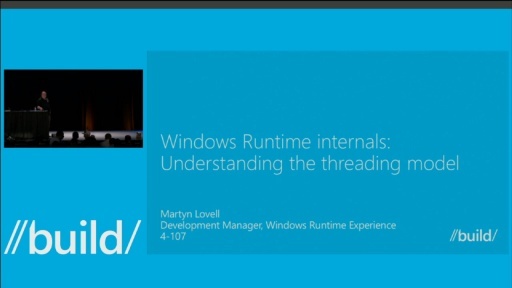 What actually is the Windows Runtime though? This session explores this key question by digging into the concepts of language projections, the WinRT type system and advanced API patterns included in the Windows Runtime. Learn how Windows uses interface patterns combined with language projection to present modern concepts in a natural and familiar way to each programming language. Been dogged with syncapation issues due to non support for low latency sound effects in Silverlight 4. Is it reasonable to expect not to have such issues with Metro/XAML/WRT apps under Win8? Super excited if that is the case. when will the track be avaiable? Is winRT a new COM more slim because it uses the new features of C++ language? Hmm. I could swear Microsoft already has something like that. It's on the tip of my tongue. Starts with dot and ends with 'ET'. And I'm sure there's an 'N' in there somewhere, but I can't quite put my finger on it. Luckily, this WinRT is entirely written in native code, so it is more efficient than .NET. WinRT is basically baking .NET-Concepts into the OS at a native level by having an pumped up COM reusing a lot of concepts. So the longterm strategy is to get rid of Win32 by extending WinRT. And after that they will also want to get rid of the .NET-CLR in the long term. Makes sense for me but until we will reach the completely consolidated point we have a whole plethora of choices. So, are you saying that there would be a chance web app like ASP.NET to be built into WinRT itself in the future, by deprecating .NET? Well as a .NET Developer you already use different runtimes on the Desktop, in Silverlight, on the Phone ... but usually you aren't aware of it because the development experience is nearly the same. So I think there will be a ".NET-Experience" using the WinRT. There will be a whole bunch of new namespaces (Windows. * instead of System. *), maybe some kind of translator like they did between Java and .NET. 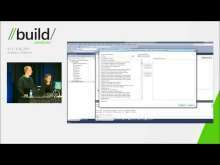 The best of .NET-BCL will be ported to WinRT (less successful APIs will be left behind). And the CLR will be phased out in favor of the native runtime. So yes, I definitively think that there will be something like ASP.NET for WinRT. If something is called as epic as the "Windows Runtime" I think it will be part and base of everything that has the Windows brand. Awesome presentation! Great, deep presentation! Lot's of coding examples!! I will definitely have to watch this one again. Great work Martyn! Very interesting. Yes, this is like a combination of ideas from COM and .NET and that's great. I hope it works as smoothly as advertised. Joining the side story about WinRT and .NET here. When .NET came out, it covered a lot things that devs had wanted in the 90s. Managed memory, a common type system etc. Anyone from the VB6 and VC++ days would remember that these types didn't talk nice, String in VB, and you don't know what kind of string to use in C++, CString, char*, CHAR* BString etc. So many of these things were addressed and a new language came on board. Building web apps wasn't a totally alien experience anymore, objects written in one .NET language could be accessed from another with ease. .NET however left gaps and I remember reading many suggestions, debates etc. (probably participated in one myself) about all the stuff on platform invoke etc. A common suggestion was that instead of having all this pInvoke stuff, an Object Oriented API would be a welcome addition because you still cannot easily figure out what kind of type to pass when the API wants a pointer. So this is pretty much what WinRT is. It covers the gaps that were left by .NET and means that we don't have to write as many, if any, pInvoke statements. That's what I think anyway.